May 28, 2016 and it’s a return to the Copthorne Hotel in Slough (not Windsor, despite the name). I’d been there for a few Big Finish Days, so found it hard to resist comparing the two events, despite their natural differences. I made a few notes, took a few pictures and chat to a few people. If you’ve been to the hotel for Big Finish day, this Doctor Who Magazine 500 day was around half as busy. There was no over-spill into the hotel foyer, and the main room was split into two. The dealers’ area was crowded as ever, but only part of it was Big Finish, the rest a range of memorabilia stands selling everything imaginable and then more. Other areas were less crowded, and it was possible to get seating in the bar and chat to people. The big difference was the main area. The part for the programme was the usual TARDIS mock-up, posters, projector set-up and Tom Spilsbury gave a fine introductory talk, played from video clips of various people congratulating the magazine, and there was a range of conversations through the day. 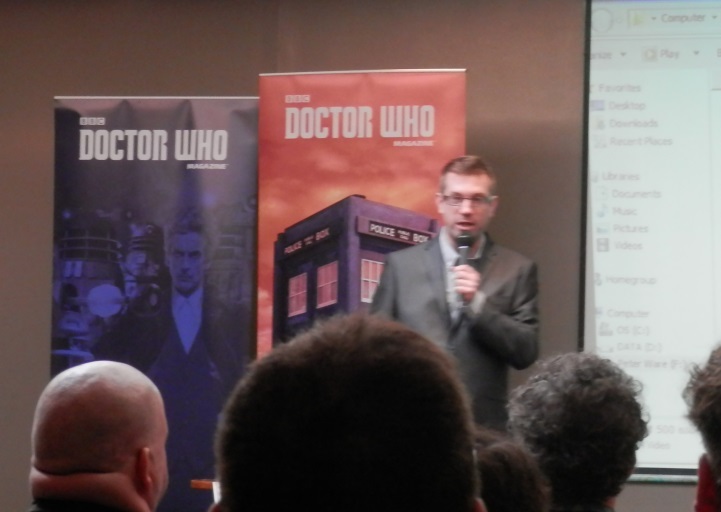 Toby Hadoke seemed to lead most proceedings, and I caught most of a chat with Sophie Aldred. Sophie was waxing lyrical about A Charitable Earth (Sarah Jane Adventures) and how she hadn’t immediately twigged the initials spelled out ACE! In Sophie’s view Ace would still be keen on action, and Charitable Earth would involve flying around the galaxy in something resembling the Millennium Falcon. The other half of the main area was laid out with lots of tables and a chance to catch up with various artists/ writers and other creatives involved in DWM or Doctor Who over the years. I managed to catch up with Andrew Smith, Simon Guerrier, Dan Starkey and Alan Barnes, even if only briefly in some cases. There were plenty of others and this gave the occasion a special feel all of its own. A bit of a one-off, and possibly the last convention at the Copthorne, and a good day. If you were there and I didn’t say hi, apologies now!